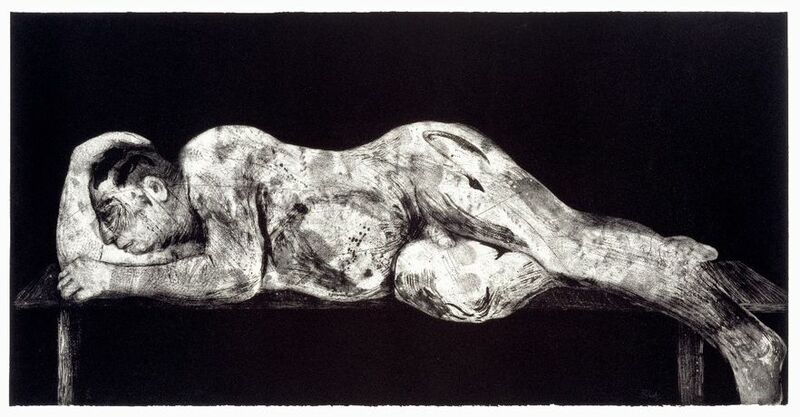 William Kentridge- Sleeper (Black), 1997 Etching, Aquatint & Drypoint. 97 × 193 cm. Edition of 20. 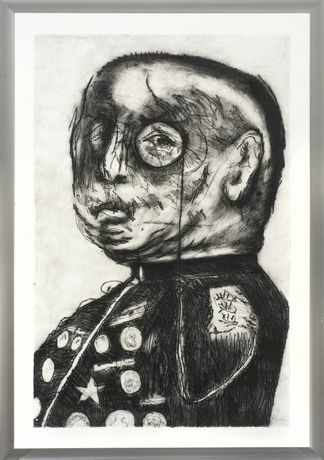 William Kentridge- General (1998) Etching.120 × 80 cm. Edition of 15. Multidisciplinary group Show featuring William Kentridge, György Kovásznai, Marcelle Hanselaar, Yvonne Crossley, Kate McCrickard and Cally Shadbolt. 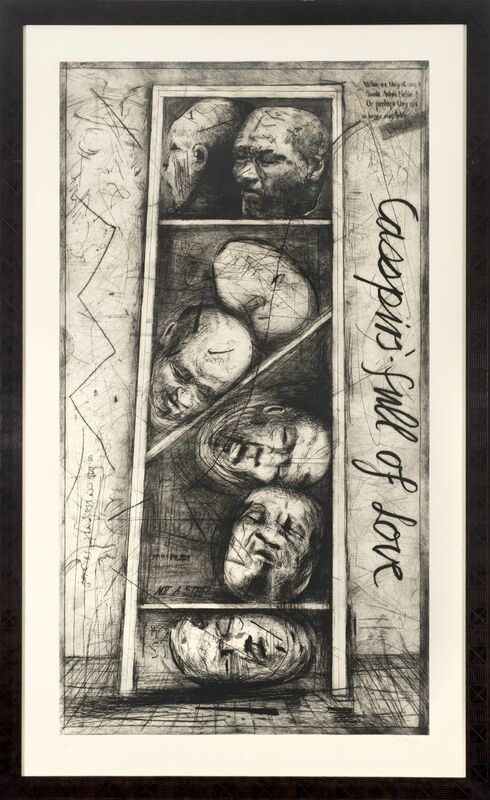 Group Show Creative Fury offers an alternative showing of works by William Kentridge (b. 1955, Johannesburg) in the context of the Hungarian Cold War artist György Kovásznai (1934-1983) and four mid-career contemporary artists: Marcelle Hanselaar, Yvonne Crossley, Kate McCrickard and Cally Shadbolt. Selected works and films will be shown alongside printmaking, drawing and painting. Creative Fury brings an opportunity for more insight into the work of William Kentridge, at a time when the Whitechapel Art Gallery is staging a major show of his work in London, yet places his work in context with both an artist from the past and artists working in the present. Kentridge begins each of these films with a single drawing that he alters, adds to, and subtracts from, bit-by-bit, photographing each change and working without a script or storyboard. His narratives and imagery--at once melancholy, graceful, and open-ended--emerge through this unusual, labor-intensive working process. In the end, he is left with one short film and a very small stack of drawings, one for each scene in the film, but the process of transformation is at once evident and dynamic. 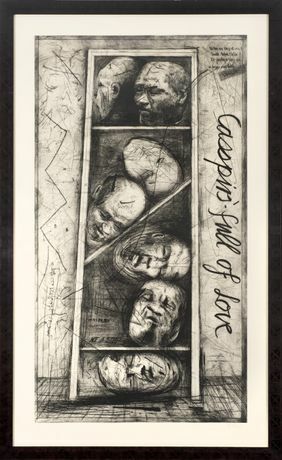 An early drawing and some of his most iconic prints, including The General, Sleeper (Black) and Casspirs Full of Love, all contemporaneous with the films, will also be on show around the gallery, alongside more recent works. Kovásznai was primarily a painter, who practiced the art of painting on both canvas and the cinema screen and he is often seen as a free-spirited, universal artist whose work cannot be classified into any known artistic school of thought. His unique oeuvre consists of paintings and drawings, as well as experimental animation films in which he attempted to “animate” the art of painting - an entirely different approach from mainstream animation. Politically, Kovásznai was attached to Marxism, yet had an ongoing conflict with the ruling regime. A significant part of his work reflects on the spring and summer of 1968, and the events in Paris and Prague. Paintings from his short film “Ca Ira: The song of the French revolution’, will be shown, with Marat, Saint-Just and their companions depicted as increasingly threatening figures, looming on the horizon of the 20th century. The four contemporary artists that we have selected to show alongside Kentridge and Kovásznai have similar creative concerns, yet are developing work along their own individual paths of interest. In curating the chosen works within the gallery space, we hope to reveal new insight and inspiration into the process and drive behind the fury of creation. Yvonne Crossley’s work relates to the human figure as a way of looking at the relationship between ‘the individual’ and ‘the rest’, both as something to celebrate and as a source of anxiety. Her work involves drawing, constructing, painting and print, consistently bringing together a range of human images and forms to examine concepts of individuality within social groupings in the 21st century. Solo exhibitions include; The Ikon Gallery (Birmingham), The Laing Gallery (Newcastle upon Tyne), Battersea Arts Centre (London) and Stanley Picker gallery (London), She has also exhibited widely in group and open exhibitions throughout the UK. In the past few years she has been invited to join a number of selection panels including; the Jerwood Drawing Prize, Hugh Casson Drawing Prize (RA Summer Exhibition), RE: Drawing – Oriel Davies Gallery, Drawn RWA Bristol and The Derwent Art Prize. Painter and printmaker Marcelle Hanselaar explores how we reconcile our animal instincts to the expectations and conventions of civilised living. Her penetrative imagery acknowledges the darkness within us. Solitary figures, contained and introspective, are less portraits, more personifications of private emotions or states of mind, whilst group ensembles - seemingly processionals or rituals - act as allegories or perhaps cautionary tales of lust, abandon, greed and power. Hanselaar is a Dutch artist living and working in London. Her etchings are held in many prestigious public and private collections, including the V&A, the British Museum and the Ashmoleum, and she has exhibited widely both nationally and internationally. The Barflies gathered in Kate McCrickard’s prints and paintings are all observed from café bars of Belleville, near her home in Paris. She draws people fugitively in quick line sketches that are then worked up in the studio in print and in paint. Subjects are sometimes looking inwards propped up against the counter and sometimes looking outwards from the café at the world outside. She draws what passes before the eye and sketches on the sly, looking for forms without event, structure rather than narrative, but the types are familiar and function as cosmopolitan messengers. “I like the sense of movement that pentimenti and underpainting bring to a work. I prefer to paint on scraped-off rejected canvases that provide unexpected tertiary-colour grounds. The pristine white canvas is too sterile for me – I need something to work against. And I like the "honesty" of leaving the struggle of the working process visible. McCrickard is a British artist and writer based in Paris, France. She graduated from Edinburgh with a double first MA in Fine Art. Her work is in major collections, including The Royal Scottish Academy and The British Museum. Her practice includes paintings on canvas and cardboard, drawings, etchings and monotypes. Recent exhibitions include solo shows in New York (2013 & 2015) and London (2014 & 2016) along with appearances in over 10 art fairs in the last few years in New York, London, Paris, Capetown & Johannesburg. 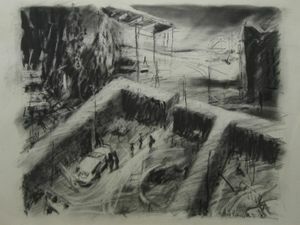 McCrickard ran David Krut Projects in New York for several years, working with artists including William Kentridge, on whom she wrote a monograph for Tate in 2012. She is a regular contributor to Art in Print. Cally Shadbolt’s filmmaking started with the premise that drawing with the use of very limited resources, could generate a higher degree of creativity. Her tools are limited to a pencil, a mobile phone and one sheet of paper. The films operate as animated sketches, or visible thought. They can be seen as providing a place in which an object can revolve, repeat or change. It is a space into which she can project herself and work with an imagined material in 3 dimensions without needing to make a physical product. “There is no narrative. The action never gets to the good bit. Instead the objects remain mesmerically static in time.” After the event, the history of the drawing remains visible on the paper and, sometimes, evidence of the last take of the animation. Cally Shadbolt has had solo shows in the Project Space at Milton Keynes Gallery in 2012 and 13, has been shortlisted for the 2015 Jerwood Drawing Prize and has taken part in group shows in India and Italy. Thanks to- William Kentridge, Dori Kovasznai & the Kovasznai Foundation, Karsten Schubert, Tom Rowland, Kate McCrickard, Jenny Page and Portobello Brewing Co.